Summer is officially over, and for the last month or so everybody, including us, has been getting all wired up about fall fishing (which around here means trout!). We've had some good recent floats chasing rainbows, browns, and brookies on the Upper Andro. 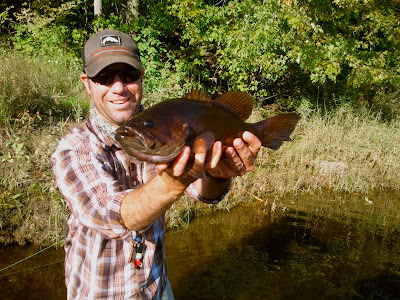 The bite is on, the flows are good, and fall color is going to light those mountains up shortly. Even so, we still like to sneak out for a late season bass float every once in a while. Leave your poppers and floating line at home. Bring your sink tip and the meat locker- that fly box loaded up with pattern's that look like half of a dead chicken and small furry creatures. With water temps around 60 degrees, they've got the feed bag on.